Wow! There’s a lot going on at OWH. With all the challenges and activities it seems like we’re picking up new cardmakers every day. Which is awesome! This post isn’t just for the new folks, but I feel like introducing myself so I will. Hi. I’m Kate. I coordinate the Tuesday Tutorials for this blog, and I also maintain the Cardmaking Glossary. I watch the OWH Facebook Page pretty closely, and I frequently see people (new and “seasoned”) asking questions that are answered in the Glossary. Note – Asking questions is good. Always feel free to ask questions. Thing is, if you can find it in the Glossary, you’ll have your answer jiffy-quick without waiting for someone else to answer it. So, check out the header on the blog above. Here’s a picture of the drop-down list of Resources (click to enlarge). The first option is a list of all the Sunday Sketches to date. Very handy to have in one place when you’re looking for inspiration. The second will give you all the posts that are tagged “Tutorial,” in reverse chronological order (newest first). If you’d rather have a list of the tutorials by title and type, check out the Resources Page on the main OWH site. The next three choices are posts tagged as 101, 201, or 301 Tutorials. Then posts tagged Featured Cardmakers (again, all the choices sorted by tag will be by date, newest first). So, what’s in the glossary? When I update the glossary (about once a month) I go through all the posts on each of the OWH blogs since the last update. 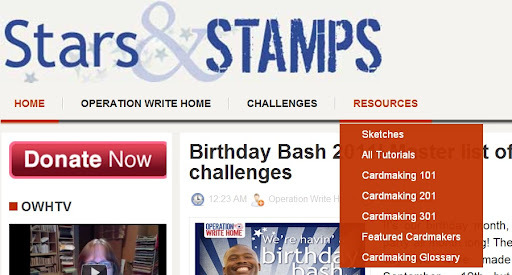 So there is information from Stars & Stamps, Homefront, and Hero blogs as well as the main OWH website. I do my best to delete out-of-date links at the same time. Here are some questions that have come up recently on the FB page that are answered in the glossary. Scroll through the glossary in your other browser window to see if you can find the answers. I’m having a cardmaking event for the OWH birthday. Do you have any recommendations for how to make that go more smoothly? I know glitter is not ok on OWH cards. What about Stickles? I don’t have an OWH stamp. Is it ok to print stickers and put them on the backs of my cards? What is the “tuck” and how should I do it? I’m brand new here. How do I get started? I want to buy some envelopes in bulk. What’s the name of the company you order from? My church wants to write some Any Hero letters. Do you have any suggestions for what to say in them? How many cards of one design is too many to send? Is it ok to put sentiments on the inside of cards, or just on the outside? Can you find the answers? Here are the answers for where to look. ow that you’ve had a taste for the information that’s in the Glossary, here’s how you can make it even better. Please leave me a comment, or write me at kate@operationwritehome.org and let me know if there is any information about cardmaking or OWH that isn’t in the glossary. Also let me know if you find any broken links or info that is no longer true. Next time you wonder about something, check and see if it’s in there. Stop back in now and then. This is a living document, and it changes all the time. I’m also always looking for ideas for Tuesday Tutorials. Please let me know if you see a good tutorial somewhere or you have an idea for one to share. OWH is a community, and we all benefit more when everyone contributes. Great info Kate, thank you! Thanks Kate…I really like being able to find all of this great information in one place. The glossary is a wonderful resource and with the links it includes it makes it a logical first stop for questions I agree. Thank you Kate! Kate you do a ROCKIN job keeping that glossary updated, thank you!!! I just looked through the Glossary and the information in there is amazing.Thanks very much, Kate, for keeping it updated.